1. Sock Madness 3! I started late, am making the leg and foot longer, and am in the fastest division... but I'm not out yet. There are 9 spots left and I want to make it to the next round. I still insist that I am not competitive. Lookie the crazy afterthought heel! 2. Class lists are now up on the Sock Summit site! 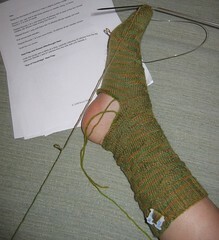 I am now allowed to say what subject I am teaching: Sock Design Workshop: Know the Rules then Break Them. I will be talking about this class a LOT over the next few weeks and months. You have been warned. 3. Shannon had her baby! (Shannon is one half of Twisted - the yarn shop where I work.) Yeah, I've been telling everyone it would be a boy. Obviously, Hazel is a girl's name... Therefore I am not good at predicting gender in utero. I can live with this. I am good at other things. 4. 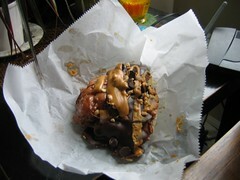 Memphis Mafia doughnut from Voodoo Doughnuts: vegan version. Well, I picked this beauty up in the wee small hours last night and am still working on it. This fritter is considered a "4-day doughnut" but I am tough enough to take it down in 2. - The grocery store is out of the kind of cereal I like. - The bus is running late and it's cold out here. - My kid doesn't like to brush her hair. - Hey guys, check out this rare Patti Smith video. - Last minute free show happening in your town that you totally want to see. - Look at this hilarious picture from 20 years ago. End rant. Sorry if I stepped on your toes. 7. Trifecta pattern hit the Malabrigo Projects Club over at eat.sleep.knit. If you love fast horses as well you should bookmark the site then pick up the kit or pattern when it becomes available. 8. 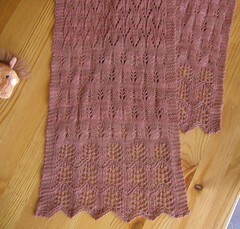 Check out the free 35mm stitch pattern over at Leethal's blog: do stuff! While you're there, check out all the other amazing crafty goodness she creates so beautifully. 9. The couch to 5k running plan! I am in week 4 and it's going really well. I use this site to plan out routes. I'm organizing a team to do the Starlight Run on May 30th. We haven't agreed to a "theme" yet but it will likely be crafty and involve a sense of humor. 10. Monday morning will bring a trip to the post office - I'm sending something to Spin Off for a future issue! I'll let you know more when I can, of course. I can't help but tease some stuff, you know. We're glad to have you back in Portland! Your Sock Madness socks are looking good. You can do it! Good luck with your Spin Off Submission!! I am so excited about your class at SS09. It is totally on my list. Good luck with your submission!!! Have a great day. I just got the new Vogue and your sock pattern is Gorgeous!! I can't wait to make them. Keep up the good work.